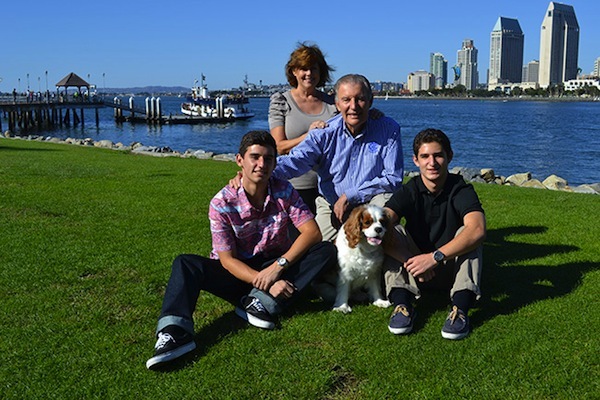 In his nearly 20 years of living in Coronado, Spiro Chaconas has hit nothing but home runs… in his business, with his family and with the Coronado community. This year, Coronado Private Bank named Spiro Chaconas its 2013 Citizen of the Year in recognition of the positive and continuous force he has been in the Coronado community. Spiro Chaconas and his wife, Nancy, own and operate Spiro’s Gyros at the Coronado Ferry Landing, which the couple opened shortly after they married in 1995 and moved from Los Angeles to Coronado. The impetus for the restaurant must be attributed to Nancy, who was inspired by the foods of Spiro’s homeland, Corfu, Greece, which they visited on their honeymoon and on several subsequent trips. Their first date was to a Dodger game, which isn’t surprising once you get to know Chaconas’ background. Hailing from Milwaukee, where he was valedictorian of his high school class and named to the All City baseball team (and U.S. All Star baseball team) in 1958, Spiro attended Northwestern University on a baseball and academic scholarship (and was selected to the All Big-Ten Baseball Team). At Marquette University’s dental school he was also class valedictorian and elected to Alpha Sigma Nu Honor Society. Chaconas served as a U.S. Navy Dental Officer from 1964 to 1966 and in the U.S. Navy Reserves from 1968 to 1994, when he reitred with the rank of captain. Each year he’d spend two weeks on active reserves, teaching at Balboa Naval Hospital and staying at a friend’s home at Coronado Shores. “I told myself, this is where I want to live when I grow up,” he quipped. chairman of UCLA’s orthodontic department. He served as a professor and chairman of the orthodontic department until 1995. During his career, Chaconas has published more than 200 scientific articles and co-authored four textbooks, with his Orthodontic textbook translated into four languages. He also authored five continuing education courses for the American Dental Association from 1995 to 1999. He holds the title of professor emeritus, UCLA. His ownership of Spiro’s Gyros led him to become active with Coronado’s business community. He served on the board of directors of the former Coronado Visitors Bureau from 1997 through 1999 and on the board of the Coronado Chamber of Commerce from 1999 through 2001. He has been a member of Rotary Club of Coronado since 1999 and in San Diego has served many years on the parish council, including six years as president, at St. Spyridon’s Greek Orthodox Church. Spiro’s love of baseball apparently was passed via DNA to Michael and Demetri, who play second base and center field, respectively, on Coronado High School’s baseball team. A proud papa can’t say enough about his boys. “As a junior, Michael led the team in batting average and stolen bases, and was one of two players who made All League and the only junior to be voted to the Junior Showcase team. He has the same number (#4) as I did and plays second base, making the same kind of plays I did; it’s really creepy because I didn’t teach him those things! He has a GPA of 4.4 and wants to be an orthodontist. Nancy and Spiro Chaconas with sons Demetri (left), and Michael and favorite dog, LeBron.